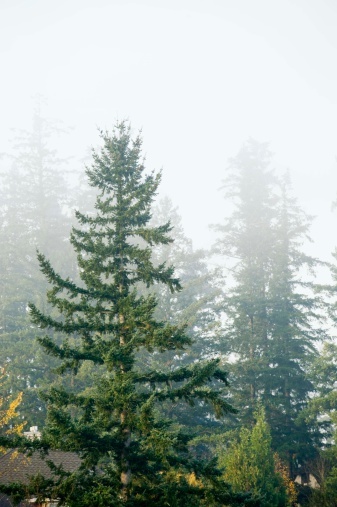 Washington's nickname is "The Evergreen State," so it should be no surprise that the state is home to at least 32 tree species, most of which are evergreens. 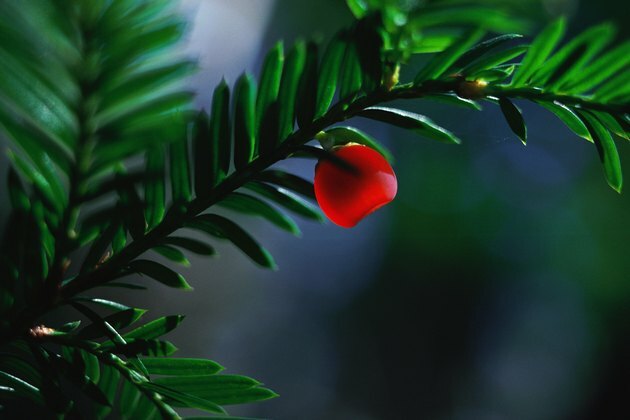 In addition to evergreen trees, Washington is home to several hardwood trees and the Pacific yew tree, whose bark and needles are used to make cancer-fighting drugs. 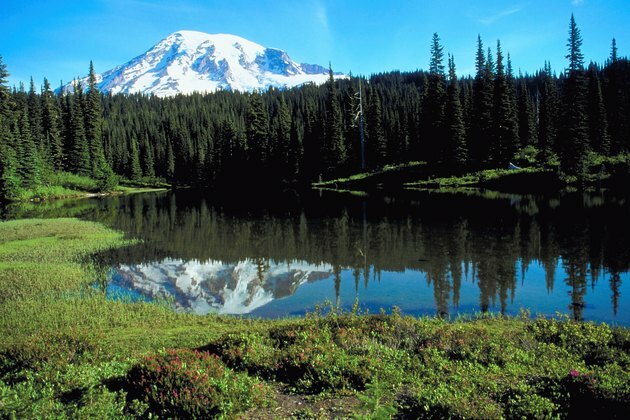 Washington is home to vast evergreen forests. Many people decorate with fir trees. Washington's pine species include shore, lodgepole, whitebark, western white and ponderosa. The western white, lodgepole and ponderosa pines are valuable for finish carpentry and paper pulp. Shore and whitebark pines serve to protect streams and prevent erosion. Washington fir species include the noble, Pacific silver, alpine and subalpine, grand and Douglas. 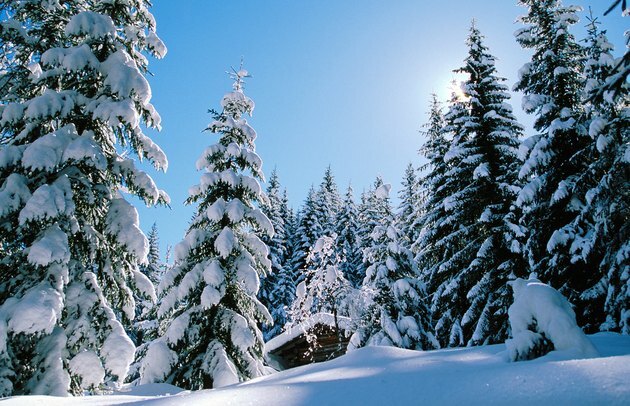 Several, particularly the Douglas and noble firs, are common Christmas trees, while others are primarily valuable for lumber and pulp. Many species often succumb to interior rotting as they age. 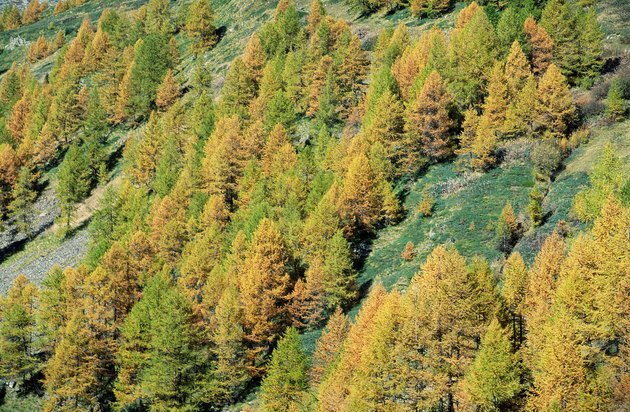 Larches are the only conifers that lose their leaves in winter. Washington's larch trees, the subalpine larch and the western larch, are part of the only group of conifers, or cone-bearing trees, that lose their leaves in winter. Although it is valuable as erosion protection, loggers do not use the subalpine larch because it grows high on mountains and is quite short. The western larch, however, can be made into house frames, telephone poles or railroad ties, among other uses. 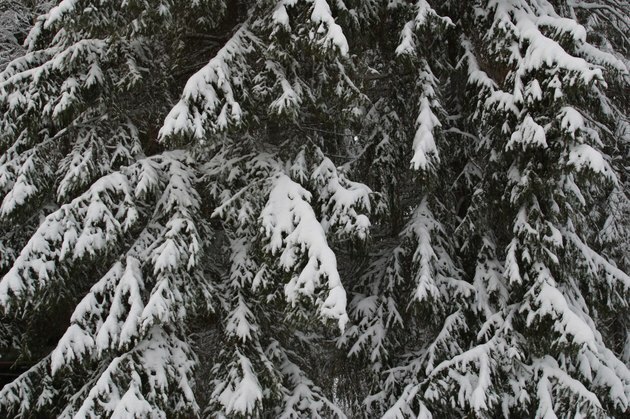 Spruce trees hold up well in snowy areas. Washington spruce species include the Engelmann spruce and the Sitka spruce. Engelmann spruce can be used for lumber and pulp, but it is not particularly popular. Sitka spruce is widely used in musical instruments, and its lightweight, strong wood makes excellent ladders. Washington's hemlock trees, the western hemlock and the mountain hemlock, differ considerably. The mountain hemlock is more of a shrub than a tree and grows so high in Washington's Cascade and Olympic Mountains that harvesting it is not worth the effort. The tall western hemlock, on the other hand, is Washington's state tree and is very important for both lumber and paper pulp. Cedars and junipers can grow in strange places. Washington's cedar and juniper species include the western red cedar, the Alaska cedar and the Rocky Mountain juniper. Western red cedar wood accounts for nearly all the wooden shingle and shakes in the United States. Western red cedar and Rocky Mountain juniper are used to make fence posts as well. Alaska cedar grows mostly in mountain areas, and its wood is useful for boat building and fine carpentry work. Pacific yew bark and needles contain cancer-fighting chemicals. The Pacific yew, Washington's only yew species, often grows in the shade of other trees and never grows very tall. 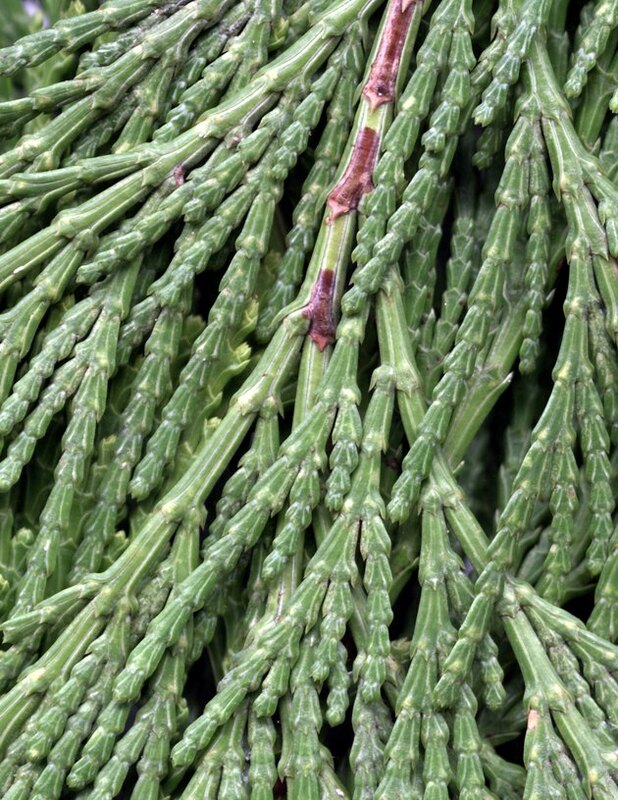 Its needles and bark secrete small amounts of paclitaxel, a powerful cancer-fighting compound. Although a similar chemical can now be partly synthesized in a lab, the Pacific yew remains an important part of the fight against cancer. Willow trees help protect water sources. 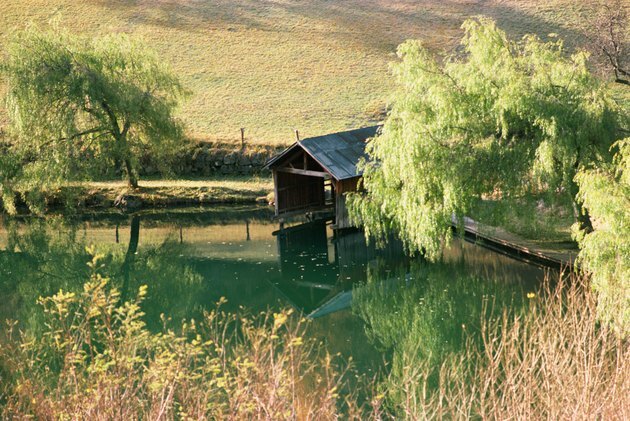 Washington is home to 12 willow, one aspen and one cottonwood species. Only the black cottonwood is commercially valuable and is useful as paper pulp, firewood and veneer for plywood. Willows and quaking aspen are primarily useful as soil and stream protection. Washington birches are used for furniture. 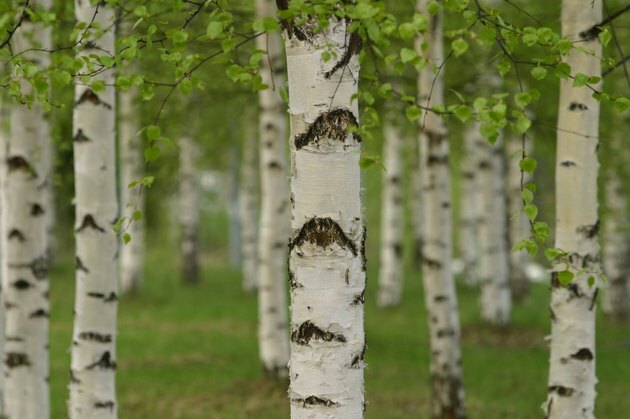 Washington has only a few birch trees, which are used for furniture when available. Washington's only oak species, the Oregon white oak, grows in rocky areas and mainly serves as firewood for individual homes. Red alder is "the most important hardwood in the state," according to Washington State University. It grows quickly and can be used for lumber, paper pulp and furniture. Maple leaves have long veins. 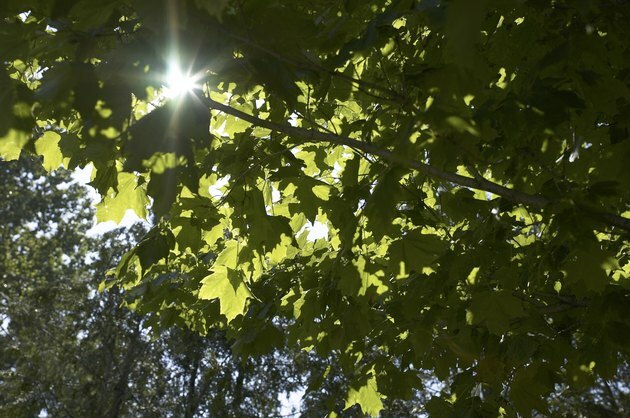 Washington has two maple species, the vine maple and the bigleaf maple. The vine maple produces excellent firewood and provides food for animals but is otherwise a nuisance, as it tends to form dense thickets. The bigleaf maple produces good firewood and is used in producing furniture. Many cities also use bigleaf maples as shade trees. Washington's only dogwood, the Pacific dogwood, is primarily a decorative tree. 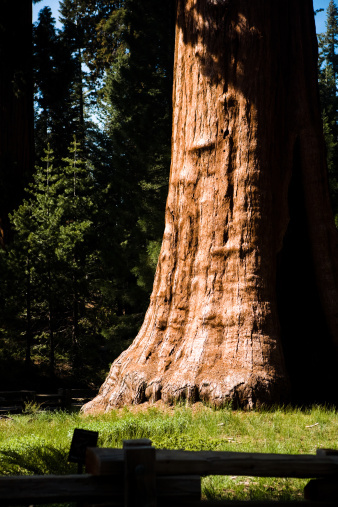 Washington also has a few trees that don't fit neatly into a larger category. 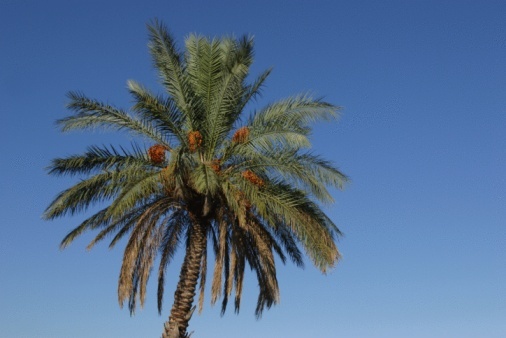 The netleaf hackberry, for example, is a small tree that produces berries and has few uses beyond soil protection and providing a small amount of food for animals. The cascara's wood has no commercial uses, but its bark is used to create a laxative. 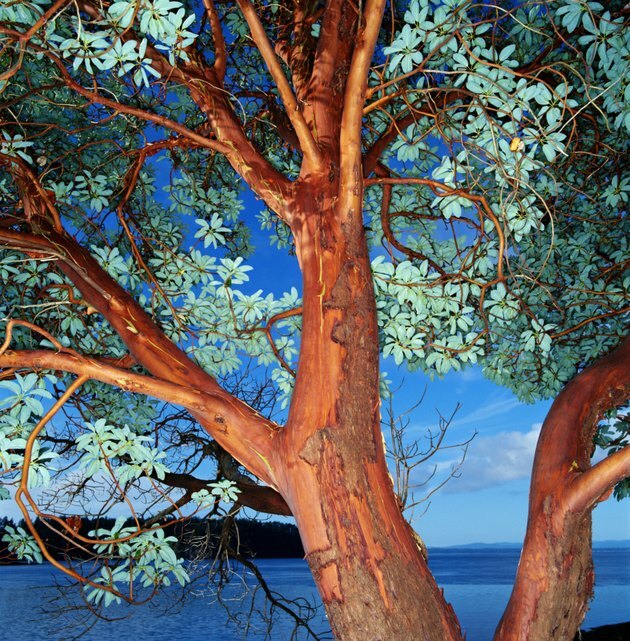 The Pacific madrone has reddish-brown, scaly bark and only grows near salt water. It has broad leaves but does not lose them in winter. The Oregon ash grows all along the coast, but it is used only occasionally for firewood. Andrew Cockerham is a world traveler and perpetual student with He has been writing since 1999. His work has appeared in "The Gadfly," an annual literary journal, and "Spectrum." He holds a Bachelor of Arts in writing from Walla Walla University.